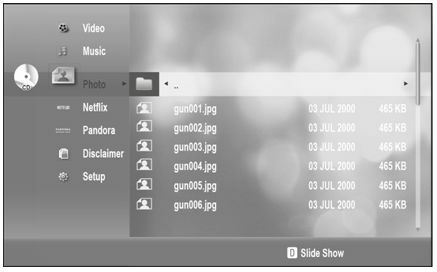 How do I view photos (JPEG) on my blu-ray player ? 2. Press the ▲▼ buttons to select the Photo, and then press the ENTER button. 3. 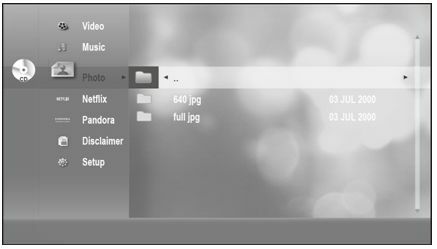 Press the ▲▼ buttons to select the folder you want to play, and then press the ENTER button. 4-1. Press the BLUE(D) button to start slide show. 4-2. 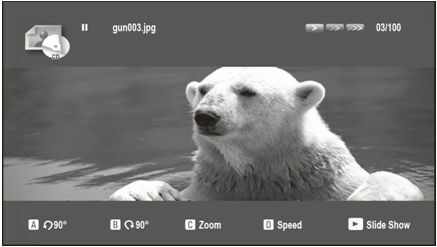 Press the ▲▼ buttons to select the picture you want to play, and then press the ENTER button. You can operate rotation, zoom and slide show function. RED(a) button: Each time this button is pressed, the picture rotates 90 degree counterclockwise. GREEN(B) button: Each time this button is pressed, the picture rotates 90 degree clockwise. BLUE(D) button: Selects slide show speed. PLAY button: The picture enters slide show mode. My Remote Is Not Working, How Can I Determine If I Need A Replacement Remote? How to Change the language options? 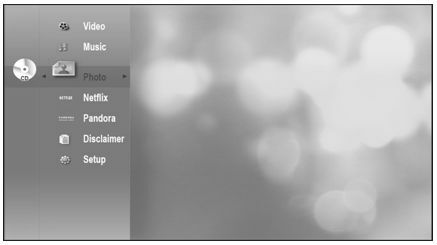 How do I set up my display options on my Blu-Ray player?